Adamant Vermont is a remote town nestled between Montpelier and Calais. During the early blissful summer months, Adamant is over run with menacing swarms of pesky, blood-sucking black flies. Residents wear thick netting to avoid the red, itchy welts that appear post-black fly attack. Five years ago Cindy Cook decided to fight back creatively by organizing the Black Fly Festival. If you can't beat 'em, well, you can at least have a good time celebrating their buggy awfulness. 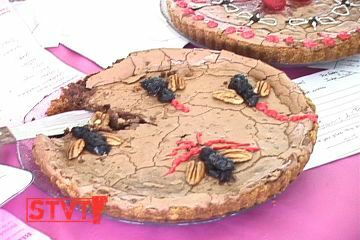 On Sunday, May 20th, the 5th Annual Black Fly Festival festivities included a Fellini-esque parade, a bug-inspired pie contest and a black fly anthem song writing contest. Proceeds benefit the Adamant Co-op which is at the heart of the town (literally) and helps to bring the tight-knit community even closer together. Adamant was once a quarry-town called Sodom but the name of the town was changed when the post office protested. Like most small towns, Adamant's history sounded a little different depending on who you talk to. Beautiful Sodom Pond continues to breed black flies. Local Ethan Allen impersonator, Jim Hogue led the parade on a stunning black horse and did his best to capture a black fly for me. Across the brooke is a music school which has brought new life to the town and above the co-op are the studios of local artist, Janet MacLeod who is also the current Adamant Co-op President. I learned how to say "black fly" in Abenaki and why the tri-cornered hat was invented (yes, two people just happened to be wearing them, go figure). I also met a gaggle of local kids who obliged me with a horror movie re-enactment of a Black Fly Attack and some energetic farm girls who swatted flies and made wonderful faces. 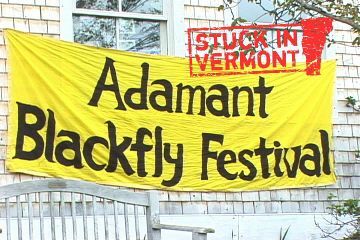 The residents of Adamant are an arty, quirky, political hodge podge of good-hearted people who know how to throw a feisty Black Fly Festival. PS While editing this vlog I got the distinct impression that insects were crawling all over my body and that I had itchy bug bites left over from Sunday. Ethan Allen said that a black fly could hide under your watch band and then bite you two days later so it is possible that this happened to me as well. More than likely though, editing a video about creepy crawlies makes one rather paranoid. PPS Check it out, hopefully the compression on this vlog is a slight step up. I am working on it! Another great installment of Stuck in Vermont! You were brave to wear a skirt to the festival (not because of the black flies, but because of that leg-peepin' Ethan Allen). the black flies at star lake are huge and sluggish and easy to kill before they bite you. but man does it smart and then welt! you sure do get sent on some interesting quests ms. sollberger. PS I forgot to mention that it was FREEZING and I was underdressed thanks to the sunny weather in Burlington. And Janet McLeod, very kindly, lent me a jacket. What a nice town! I am NOT from Vermont, but I have a question for native Vermonters. Why is it that Vermonter women (not transplants) insist on wearing beards and leg hair? It isn't attractive and the men here aren't happy. Men don't like having to worry if the women they are dating could kick their asses. I guess it's good to take a Vermonter woman hiking with you in case you break your leg. At least then you will have someone to carry you back to the Subaru. SHAVE YOUR BEARDS and CUT OFF YOUR DREADLOCKS. Tweezers are cheap. Buy some! Good Lord! More spam from Not From VT. I am glad to post my views and points in this blog.